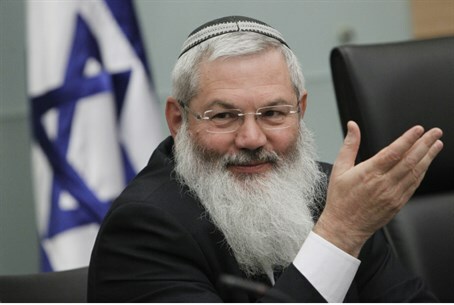 Deputy Minister of Religious Affairs to run on Jewish Home list; Tekuma wishes him success amid rumors of split. Deputy Minister of Religious Services Rabbi Eli Ben-Dahan announced Friday that he will be running in the Jewish Home party primaries for the 20th Knesset. Rabbi Ben-Dahan has worked adamantly in recent weeks to bridge the gaps between Jewish Home Chairman Naftali Bennett and Tekuma faction leader, MK, and Housing Minister Uri Ariel (Jewish Home). In that vein, he said, "the world of my morals requires me to keep the unity of religious Zionism and the Jewish Home," and he is running to "allow voters to give me the mandate to continue to serve the people of Israel." "I believe we have an historic opportunity to keep the unity of religious Zionism against the other parties in the national camp, which is falling apart before our eyes," he added. "The Israeli public has a strong right-wing party that believes in the people of Israel, the Land of Israel according to the Torah of Israel." "I welcome the addition of the Deputy Minister of Religious Affairs, Rabbi Eli Ben-Dahan, to the Jewish Home list for primaries," Bennett stated. "In my work I have discovered that he is a heartfelt friend of Israel and that the Torah is before him." "Rabbi Ben-Dahan showed courage when he brought himself to the decision of the public and the electorate has rewarded him for that," Bennett added. During his tenure at the Ministry of Religious Services Rabbi Ben-Dahan promoted the opening of registration areas of marriage to a person's place of residence, instead of merely his birthplace, and Knesset bills to allow female kashrut experts the ability to make decisions on Kosher-related issues in the Rabbinate. Rabbi Ben-Dahan has moved over to Jewish Home from Ariel's Tekuma faction, which responded to that decision later Friday. "We wish Rabbi Eli success," it stated. "There is no doubt that close personal ties formed between him and Naftali Bennett would give him a significant advantage in the race over the other candidates, thus allowing a person worthy of being part of the list to the Knesset as he did so as a National Union candidate." The announcement surfaces amid talk of a possible split between Jewish Home and National Union/Tekuma, after rumors of a new deal with Tekuma consisting of a full combination between the parties caused considerable controversy within Jewish Home aired a few weeks ago. The parties united prior to the previous elections, in a move touted by some as ending factionalism in the religious-Zionist public and which saw their joint Knesset showing rise from 7 to 12 seats. However, they did not formally merge, and talks to achieve such a merger have been a source of contention between the two camps. The deal proposed by Bennett would consist of a full combination of the two parties in their legal, financial and political aspects, as well as a number two spot on the party's Knesset list reserved for the Tekuma chairman. It would essentially make Ariel the only MK other than party chairpersons not required to take part in campaigning; it would also ensure Tekuma 120 members on the party central committee, which will be expanded to a total of 1,300 members, as well as spots in Jewish Home institutions in the next term. Ariel, however, is reportedly demanding a larger number of spots reserved for National Union MKs and opposes primaries, arguing they are a waste of funds and a chance for mudslinging. He also has spoken of having strong ideological differences with Bennett, who is seen by some as watering down the religious Zionist nature of his party by actively pursuing the secular and Druze vote, a feature recently illustrated in an Arab Muslim female candidate for Jewish Home.